Many years ago when Toima Kiroya and his wife Philomena were still children the Tanzanian government demanded of every Maasai family to send a least one child to school. At that time Toima was the youngest and too little to tend the sheep, the goats and the cows and so it was him who was sent to school. Philomena, even though being a girl, enjoyed formal education too, a circumstance which until today is rather unusual in Maasai society since women experience only very little esteem. Having had the opportunity to attend a school in Emboreet, the village where they were born, both Toima and Philomena were allowed to realize the importance of a solid school education. Presently the Maasai population doubles in less than 20 years. According to the census in 2013 the number of Maasai was 840,000. In 2003 the population was 400,000 Maasai and in 1993 it was 377,000. The economic productivity depends on the heads of cattle however the number of cows cannot be raised arbitrarily. Whole flocks die due to overgrazing and to lack of water. As a consequence the Maasai become more and more impoverished and can no longer participate in the economic development of their country. Poverty is closely linked to the lack of education and in the Simanjiro District, where Toima and his wife live, according to the last census the rate of illiterates amounts to 73 percent. But the two strove for more: together with friends they founded a charity, the ECLAT Foundation, in order to establish a secondary school in their village. There are public schools (with limited effectiveness as the rate of illiterates shows) but no secondary schools. Therefore they initiated the construction of a school with their own means. They tried to get as much financial support as possible in Tanzania. However the means available are rather limited and accordingly the school is a small one. In 2013 Emboreet secondary school students for the first time celebrated their final examination after 4 years in school. Today, 5 years after the beginning of the project, 133 students attend the school. To stay in her place of birth was important for Philomena because she attempts to improve the situation of women in Maasai society. Supported by the Belgian Embassy she initiated women and micro credit projects – a task which no European educated as he or she may be, nor a man or a woman from another tribe would have been able to manage successfully. Philomena and Toima remained faithful to their dream: to show their own tribe, the Maasai, a way out of a seemingly hopeless situation. When they received the Belgian Harubuntu award for the ECLAT project in Brussels in 2011 this was an acknowledgement of their commitment and encouraged them not to give up. Also in Tanzania schools have to be constructed and managed according to state requirements. The ECLAT Foundation closely cooperates with the responsible governmental departments thus performing an important controlling and managing function in the school board. That way the school adjusts to the state school system – a prerequisite for sustainability. The school is meant to be handed over to the state which will be responsible for the school and which for example will employ the teachers. As a consequence the school will not be dependent on sponsors for decades. The sponsors “only” need to help with establishing the school. So far there is only one building with only a few classrooms, one of which is used as a room for staff and administrative matters. The teachers live in the former house of Toima and his family where they share a very confined space. They do not have a study to prepare classes or to assess student work. Like nearly all secondary schools in Tanzania Emboreet secondary school is also a boarding school. The students` families live far away and there are no bus or any other transport facilities. That is why the school in Emboreet has two dormitories so at least the girls can stay overnight. The boys live in the surrounding villages and some of them still have to walk a long way to school every day. Water is scarce in Emboreet and the dry season lasts 7 months. Hardly anybody has a ground water pump and the ground water level lies deep. At the beginning of 2014 the Welfare and Education Foundation provided money for the school`s supply of water. A well has been sunk and a water tank was built. The water pump from Germany and its supply of energy through solar panels is on its way to Tanzania. It is meant to pump 30 m3 clean water into the tank from a depth of 90 metres daily enough water for a much greater number of students. … took place in October 2013. Dr. Fred Heimbach was invited as guest of honour. It was a great and varied celebration. To attend the event the students` relatives came from far away villages, some even from several days march away. They wanted to witness how their children celebrated their graduation. Above all however they wanted to see their big white hope and example, Toima Kiroya, and naturally his wife who has become an important model for Maasai women. They both come from Emboreet and are still members of the village community – it is obvious that they adhere to their origins. Thanks to the education they have enjoyed they have become rich and influential to a certain degree and they even have made friends in Europe. One of their friends, namely Dr. Fred Heimbach, was brought along to the first graduation. The celebration lasted a whole day, the students sang and danced, long speeches were delivered and the students received their certificates with beaming faces. Their joy was infecting and their relatives were filled with pride. 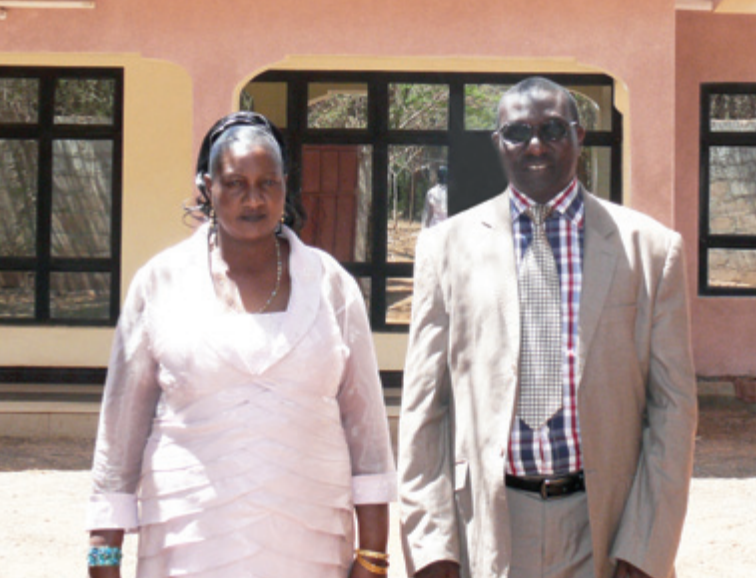 In 2011 the Harubuntu price was awarded to Toima and Philomena Kiroya as an acknowledgement of their commitment to the ECLAT Foundation, an appreciation which encourages them not to give up.